This Saturday, I will start feeding my 6-month-old purees. 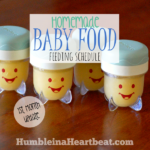 I plan on making all of them, because I’m not a huge fan of the jarred baby food from the store. I have a personal philosophy that if I wouldn’t eat it, my kids should stay far from it! 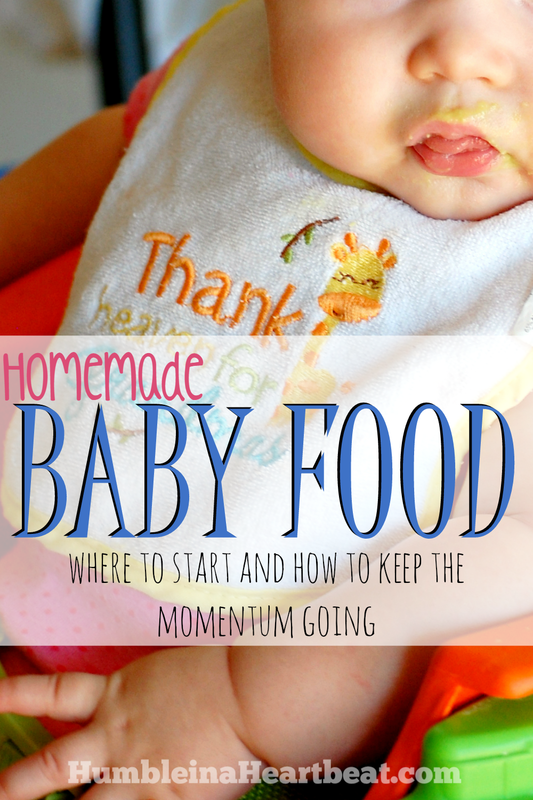 When I started making baby food, I found a lot of different great resources. 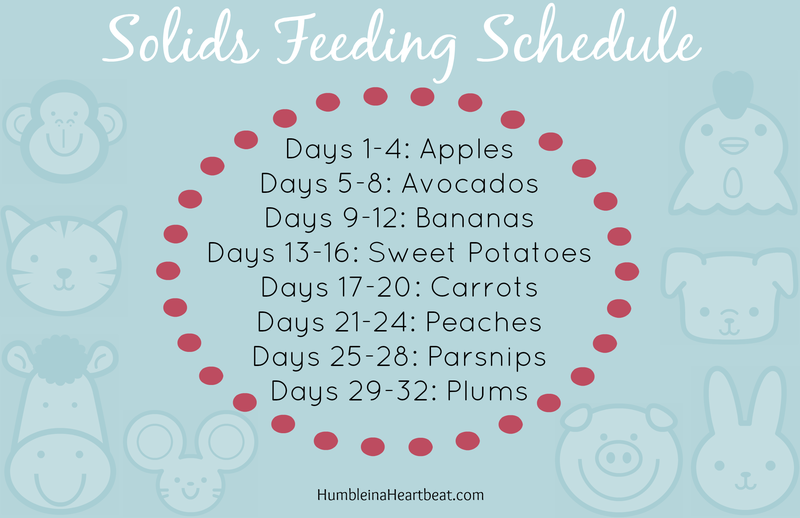 I wish I also could have known how other mothers fed their babies, so over the next few months I will be sharing with you my solids feeding schedule. 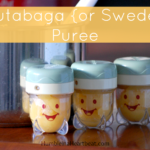 Making baby food takes a lot of time (or at least a lot more than buying it), but I think it is so worth it. I always fed my oldest daughter homemade purees, and she still eats almost anything we put in front of her at 2-years-old. Sure, she can be picky sometimes, but it’s mostly when she is sick or tired. The first month is pretty basic since we’re just making sure she isn’t allergic to anything. We don’t want to do anything crazy until we know certain foods are safe for her to eat. We can be more creative the second month. You may wonder why I am not starting her on rice cereal or oatmeal. I’ll write a post in the future on that. Here’s why. You don’t necessarily need a “recipe” for these purees. You can simply cook and mash. The avocados and bananas don’t need to be cooked and can be mashed with a little breastmilk, formula, or water. 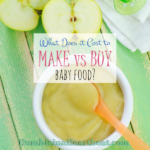 What are your thoughts on homemade baby food? *I am not a dietitian or a doctor. This is how I feed my babies, and I am providing this information for those interested in doing something similar. Make sure you talk to your pediatrician before you start feeding your baby solid foods. 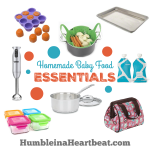 Are you ready to learn more about homemade baby food? You can access all the posts right here. 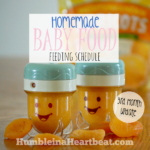 We have always been on WIC, so I’ve never made my own baby food. The main reason I hear in favor of making your own is simply because it’s cheaper than those $.69+ 4oz jars! I’m fine with the nutritional quality of the jarred baby food though. They don’t have preservatives or sugar added. And good luck sticking to the schedule. I know with my third (singleton after twins) any regimented schedule for introducing foods was totally out the window. I didn’t wait 4 days between new foods. I didn’t do it in an organized manner (veggies first then fruits) or anything. All well. 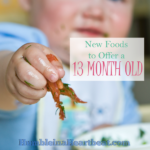 He eats finger food, really just regular food, like a champ now at only 15 months! I’m amazed and think that I should’ve offered more to my girls at this age. I don’t like the fact that jarred baby food tastes bad, smells bad, and looks bad. I never started doing it purely for cost reasons. My purpose this time around is to find out if it is actually cheaper or not. Thanks for commenting! Thank you for sharing those links with me! Your sister is pretty awesome herself for feeding her baby homemade food. I was thinking of starting my own baby food business earlier this year. I did some research, but I didn’t take it any further than that since my two girls can be quite a handful! Way to go, Bridget! I am so glad you found me, Bernadette!